It seems like yesterday that I was experiencing my first lap in Sony’s flagship Wipeout series. I’d just ejected my copy of Gex from my still new-smelling PS1 and decided to give the trip-hop racing game a try. As soon as those techno beats kicked in amongst a neon landscape, I knew I was hooked. Ever since than, I’ve picked up almost every launch Wipeout game Sony has released. Now, with the debut of the Playstation Vita, Studio Liverpool is taking its insanely fast combat racer to the powerful handheld. 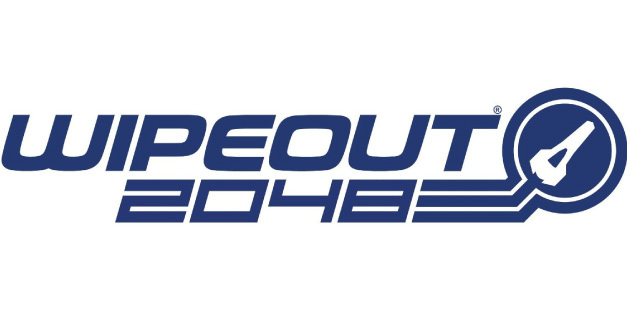 Having to follow Wipeout HD is a hardact, and while 2048 improves upon the formula in many aspects, it also falls well short of being the best Wipeout title. The intro sequence takes us through Wipeout’s fictional past. 2048 is a prequel to the whole Wipout franchise. Taking place before the first game on the original Playstation, you get to experience what the gentle beginnings of anti-gravity racing was like. The environments are way more urban than the sterile HD tracks players may be used to. 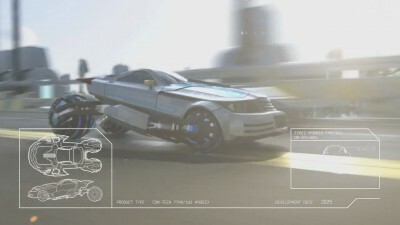 You’ll often find yourself speeding through the grass of a city park or banking in between two skyscrapers on a levitating highway. The busier environments do clutter up the screen a bit, but the visual ambiance it creates is a winner. I vastly prefer the detailed city-scapes of 2048 over HD’s hyper-color saturated world. I especially think 2048’s tracks (which are separated into the first few years of racing) create a better narrative of progress and a much needed sense of diversity. Now, where these new environments do hiccup are in the shortcuts. Throughout your racing you’ll come across plenty of small alleys and alternative routes to cut your time down, the problem is these shortcuts are always about half the original track’s size and hidden against steep turns and sudden forks. The standard tracks are manageable, if not a little crowded, but the awkward shortcut placement makes it gruesomely hard to swing in and successfully navigate the alternative routes in the already cramped circuits. This is especially damming in later races where the computer is flying through them, leaving you to air-brake into walls at 1000 mph while slowly sinking into last place. At its core Wipeout is about going fast, and 2048 has speed in spades. While it doesn’t travel at the ultra-smooth 60fps that its PS3 counterpart does, I rarely found myself complaining about the frame rate or the appearance of speed in general. 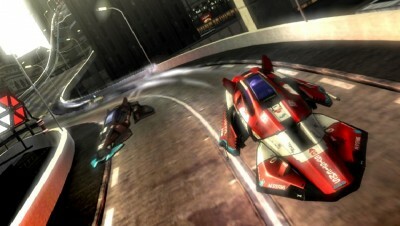 The handling is spot-on as long as you switch from the default “racer” controls to the familiar “wipeout” controls. It’s odd they didn’t give you the control scheme with air brake mechanics as a default seeing as it’s a must have to succeed. They also hide the option amongst the confusing menu system that will leave you scratching your head for the first section of the game. You’ll also get to chose from a variety of cars which are, for the first time, organized in a user-friendly, understandable way. They break the classes down as speed, fighter, agility, and prototype. All of the aforementioned cars come in one of the game specific manufacturers like Feisar and Pir-hana, and I found myself constantly picking a specific ship for a specific task. Seeing how I usually just grab one ship and stick with it the whole game, the change of strategy was a welcomed sight. I also found myself growing fonder of certain vehicles and wanting to unlock as many as I could, a feeling that never surfaced with HD’s cumbersome car clustershart. You’ll have plenty of reason to switch cars, too. 2048’s lengthy on-line and off-line campaigns stuff in a decent amount a variety. Different races not only have different rule sets like “mines only” or “boosts only”, but they also have a couple modes you can play. There’s your standard race, 1 lap sprint, battle mode (which pits racers against each other in a turbo induced dog fight), time trials, and the always loved zones mode. While all these are fun, they also seemed very different from previous installments. On every course you can earn a pass or an elite pass depending on which of the predetermined requirements you make during the race. These can range from beating a predetermined time or hitting a certain human controlled opponent in multiplayer. the problem is some of these tasks take away from the actual racing. This is doubly apparent in the online campaign, and while an interesting addition, seems to lessen the importance of some races. In a “hit two opponents” requirement, I tended to sway from taking a huge lead in front of the pack because even if I achieved first place I would still miss out on my elite pass. Perhaps the most disappointing thing in 2048 is the way race selections are handled. 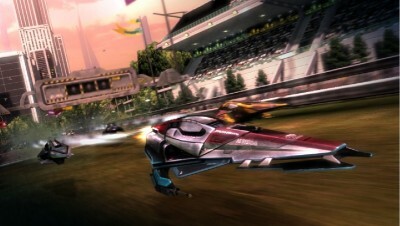 To play with a friend you must select from a pre-determined racing scenario. There is no racebox where you can select a series of tracks or conditions, you can’t even narrow a room down to just your friends list. With 2048 it’s all or nothing when it comes to single or online. Also, the load times are ridiculous. I clocked one at about 45 seconds which for a non-disc based game is ridiculous. The good news is you’ll suffer a much lessened load cycle on retry, but waiting a minute for your race to start for 40 races gets old somewhere around race 4. While being an excellent racing game for the PSV, 2048 suffers from some issues that put it behind the lauded Wipeout HD, however, it is still a fantastic Wipeout game that improves on the current generation system and showcases the Vita’s power in a way other titles don’t. The game looks absolutely stunning. But with heavy load times, inconsistent difficulty, and the lack of a racebox feature, the title falls slightly short of its full potential. Elder Geek recommends you rent Wipeout 2048 before making any permanent commitments. While it is a fun diversion, it may not be the long-lasting Vita launch title your hoping for. “I’d just ejected my copy of Gex from my still new-smelling PS1” – good memories haha, I still have my PS1 working, just all the games except for MoH Underground and Legacy of Kain Soul Reaver are up the attic. Good review, I’ve never been into wipeout games though. If you don’t have the Vita plugged in though it could be bad because I hear the battery life is rally bad with Vita. I’ve actually had some pretty good experiences with the Battery life on the Vita. I played online for about 2 hours straight and still had a good %50. Maybe that’s not too good but I’m used to my iPod choking after 30 minutes of Plants v. Zombies. I almost forgot, the intro to this game is brilliant I saw it on YouTube, maybe you can put a video of it on this page. It’s like a historical time video going through from when the motor car started racing to how the aerodynamics and technology has changed to today and then to 2048 when they more or less fly.